As fate would have it, it was not meant to be his day, and he could not finish the race! His bad luck started earlier in the week, when he was stung by a bee on his ride. He had a very allergic reaction to the sting and his leg swelled up drastically and was painful to the point that he was battling to run. Whether that or the anti-histamines had anything to do with how he felt in the race, we will never know. 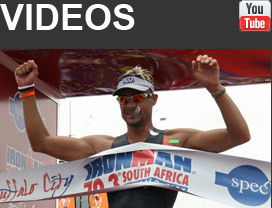 The fact is, he was cramping terribly throughout the swim, bike and the first 16km of the run. He was also vomiting, and was completely flat! This is a very hard sport, and an even harder job! He has trained his heart out for 6 months. He has been out in the rain, the wind, every condition possible. He has not missed a session, and he came here, confident that he was in the best shape of his life. But it was not meant to be, and he is extremely disappointed! You cannot win every time you race. All the top pro’s have had bad days in Kona, Norman, Macca, Reid, Lessing. They’ve all been there, and they’ve all bounced back. Raynard will bounce back from this stronger and more determined! He is considering going to IM Florida in 2 weeks time, as he wants to get a good race in asap. He doesn’t want all this training to be in vain. Thank you for all your support and encouragement! Please continue to support and believe in Raynard.